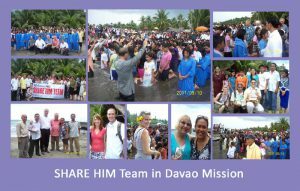 247 Precious Souls Baptized during the Share Him Team Crusade in Davao Mission. The Share Him Team of Evangelists came to Davao, Philippines to share the gospel of Jesus Christ from August 24 – September 10, 2011 held at Digos City. But before their arrival, the “adopted ministers” and laymen of Davao Mission did the groundwork for the evangelistic meetings. There were 13 venues of simultaneous evangelistic meetings for 2 weeks. 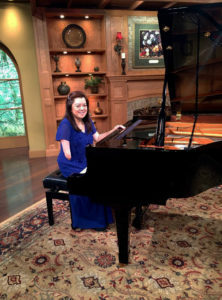 We praise God for the success of the meetings. There were 13 speakers, 9 coming from Walla Walla University, 1 from London, 1 from North Carolina- Pastor Roy Robinson, and a father and son from Washington State. A total of 247 precious souls accepted Jesus as their personal Savior through baptism. God bless these wonderful people who had just accepted Jesus Christ. We will continue to pray for them and for the AMI that God will bountifully shower His blessings so that His work will continue until the day of His coming. (Thank you for your continued support and prayers.